Even while the nation is getting fatter and unhealthier, more men are breaking 3:00 in US marathons now than in several decades, and more women are breaking 3:30 than ever before. Last April’s Boston Marathon saw one of the most horrific moments in mass-participation sports. Bombs made out of pressure cookers exploded near the finish line, killing three people and injuring 264 others, with 14 requiring amputation. But not long before all that happened, something amazing took place, something that mostly escaped notice due to the bombings. 1,962 men ran the 2013 Hopkinton-to-Boston course in less than 3 hours. This is the highest number of sub-3:00 finishers at Boston since 1984, and more than three times what it was a decade earlier. Even 2011’s big aiding tailwind, one that fueled a men’s “world record”, didn’t produce this many sub-3:00 runners. A survey of other top US marathons finds an expansion among sub-3:00 men and sub-3:30 women. The numbers were up in Chicago and, despite a nasty headwind in the Big Apple, they were up in New York too. All across the country, more and more ordinary men and women are hitting these relatively fast targets. Using data at MarathonGuide.com, I totaled the number of sub-3:00 men and sub-3:30 women at 25 major races for each year from 2003 to 2013. Here are the results. There are blips in the expansion, and this is mostly attributable to the effects of weather on a few races. Three US marathons–Boston, New York and Chicago–are so big that they drive most of the data. 2012 saw a big drop due to the NYC cancelation and hot conditions at Boston, as did 2007 due to that year’s inferno in Chicago. The overall trend, however, is dramatic. But is this noteworthy? Marathon participation is still expanding, after all. Is this just a product of more people running marathons? It turns out that the number of sub-3:00 males and sub-3:30 females is expanding at a faster rate than overall marathon participation. In other words, the percentage of people running these times is increasing–even while the total number of runners is increasing too. Here is the same data as above but represented as a percentage of total marathon finishers in those 25 major races. The conclusion is inescapable. At the front end, nonelite US marathoners are getting faster. For a long time, ordinary US marathoners were not getting faster. It’s difficult to get comprehensive data from before the Internet age (maybe impossible), but a look at the major races shows a definite slowing trend beginning in the 1980s and continuing in the 1990s. Marathoning for ordinary folks, like we see it today, more or less didn’t exist until the 1970s. The first race that ever had more than 1,000 men break 3:00 was the 1977 Boston Marathon, and two years later it had more than 3,000 men under that barrier (still the most ever in a single race). Specific numbers on the Boston Marathon aren’t easy to come by, but it appears that at least 2,000 men broke 3:00 every year from ’79 to ’84. From then, there was a general downward trend that bottomed out at 311 men under 3:00 in 2004. The New York City Marathon first had more than 1,000 men under 3:00 in 1980, a feat duplicated every year from then until 1983. After that, it was sporadic, last happening in 1992 and then not again until 2011. After the 2012 race cancelation, It likely would have happened again this year if not for a nasty headwind. The NYC Marathon’s low point was 398 in 2003. While these two races were (and are) big drivers of overall marathon data, it should be noted that some of the drop in the number of sub-3:00 men at these races is due to the proliferation of other marathons around the country. People just had other places to run. Less than a third of the men who broke 3:00 in 2013 in US races did so at Boston, but in 1977 the Patriot’s Day classic probably had the vast majority of them, maybe as much as three-fourths. The general trend is pretty clear, though. Most US marathoners were relatively fast in the late 70s and early 80s, sometimes as much as half of the nation’s finishers. As participation continued to expand in the late 80s and 90s, the front end of the pack slowed down. Over the last decade the front end has become faster again, although still not quite as fast as in the early 80s. US marathoners are getting faster, but why? And why are we not as fast as we were thirty years ago? Age distribution. My first thought was that maybe marathoners are trending younger. Most of us who have been at this for a while are painfully aware of what happens as we age–we simply can’t run as fast any more. That’s not it. Running USA’s data on US marathoners shows that age trends in US marathons have held steady: the under-40 crowd has made up 54% or 55% of the field for each of the last seven years. No change there. However, it is notable that 74% of marathoners in 1980 were under the age of 40, and that has a lot to do with why the typical marathoner was so much faster back then. Nationality. Maybe it’s not that American marathoners are getting faster so much as we have more foreigners coming to run in US races. That’s highly unlikely. First off, increased numbers of marathon “tourists” wouldn’t escape notice in the running industry and would be much talked about. That it isn’t being talked about means it almost assuredly isn’t happening. Furthermore, the increase in marathon participation in recent years has been more dramatic worldwide than in the USA. If anything, more Americans are running marathons abroad–but even if it is happening (and that’s a big if) it’s not in significant numbers. Easier access to training information. One of the thing s the internet has done is increased the amount of information we can access on just about anything, as well as the ease with which we can access it. Maybe people are getting better information about how to train via the internet. Well, there wasn’t any internet in 1983 and there were a lot of sub-3:00 marathoners then. In the 80s there were plenty of books and magazines dedicated to running training and they weren’t hard to find, so I don’t buy that the internet has made a difference. Besides, I don’t think the key to breaking 3:00 (or 3:30) is specific training knowledge. You just have to have a minimum amount of talent and be willing to log a ton of miles. Since I didn’t come up with anything myself, I started asking other people. All were surprised to hear this trend–not a single one believed that sub-3:00/3:30 marathons were increasing so rapidly until I showed them the data. Here are some of their thoughts. Clint McCormick, Toledo Glass City Marathon race director, points to formal marathon training groups as a possible cause. Those became common in larger cities about ten to fifteen years ago and have now filtered down to mid-sized cities (such as Toledo) and smaller communities. Group training is generally credited with bringing professional US distance running back into relevance and even dominance, so this appears reasonable. David Monti, Race Results Weekly publisher, wonders if the massive growth in youth soccer has had any impact. He says that “more children are aerobically conditioned at a young age”. 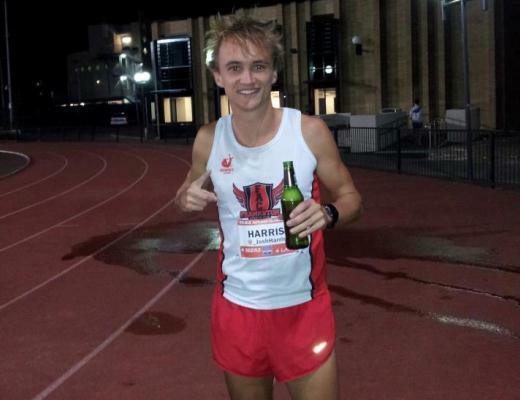 I think there are just greater opportunities for runners now to run multiple quality marathons in a year on good courses. I think this is simply that there are more bigger, well run, marathons and more race directors are realizing that having a fast course that is [Boston qualifier] compliant helps them build their race. Last year I put together a calendar of marathon in the U.S. that had more than 500 finishers the year before and was somewhat shocked by how many there were. 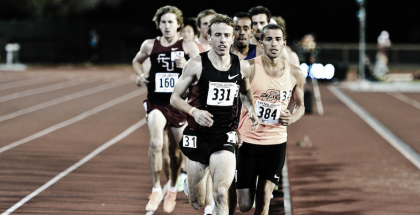 Evan Gaynor, 2:20 marathoner and 2013 Detroit Free Press International Marathon runner-up says a new generation’s attitude towards running was forged by the two movies, Prefontaine and Without Limits, which were both released in 1997. One more possibility was suggested by Running Times writer Parker Morse, who points to the 2004 Olympic marathon medals won by Meb Keflezighi and Deena Kastor as inspiring moments that showed Americans that we could run fast marathons. A close look at the data lends serious credence to this: the low points for the New York and Boston marathons were in the fall of 2003 and spring of 2004, the last editions held before the Athens Olympics. Also, the peak for sub-3:00 US marathons came in the last races before the 1984 Los Angeles Olympics, games for which US distance running fortunes did not live up to unreasonably high expectations and never could have, despite Joan Benoit’s historic women’s marathon win. Massive pre-Olympic hype fueled by a US Olympics following an eight-year US Olympic absence probably spurred on the first running boom, and if so then a post-Olympic dropoff in excitement seems reasonable. 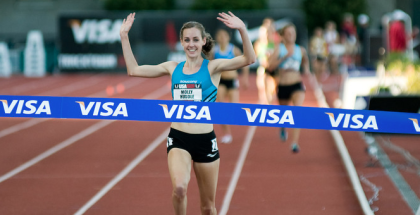 If you know much about the history of US distance running, you know it’s had a similar trend. US distance runners were not competitive on the world stage until the 1960s, the depth expanded in the 70s, then drew back in the 80s and 90s. The low point was right around 2000, and there has been a significant rebound since then. Here is a handy chart to show US distance running depth over the last three and a half decades. I looked at the number of men under 13:30 in the 5000 meters, as the 5k is a race that attracts all different types of runners, from milers to marathoners. The 1500 seems to be more of the “lingua franca” for women’s runners (especially since the 5k was not always a standard event) and my cutoff is 4:10 in that event. What about high school runners? The trend here is even more dramatic. The commonly-raced distance in high school is the mile, so that’s what I used. Note that the bottoming-out of high school performance occurred in 1993, and the bottoming-out of fast marathoning among ordinary Americans happened exactly ten years later. I don’t think this is any accident at all, as peak years for a marathoner are about ten years after high school. I don’t mean that these particular high school runners are, by themselves, fueling the sub-3:00/3:30 expansion. It doesn’t take 4:10 talent to break 3 hours; I figure anyone who broke 5:00 in high school probably has it in them. But they have something in common. Somewhere along the line there was a change in attitude about what was possible. I remember being seventeen and thinking Bob Kennedy was a god because he ran 4:05 for 1600 meters (roughly 4:06 for the mile), hands-down the top high schooler in the nation that year. Ten high school boys ran that fast in 2013, and Kennedy’s 1988 high school accomplishments would make him just a face in the crowd now. At least in part, I think inspiration by success by others around us is the reason that US marathoners have started to speed up. The Olympians, the other pros, college kids, high schoolers, they all are doing better and that has changed both what we think we can do, and what we think is worth doing. I’ve thought for some time now that track and field in general and distance running in particular are not like most other professional sports. We love or hate the Yankees, Cowboys, Red Wings or Lakers because they lend us a group identity, a sort of tribalism. That’s not the motivator for most of us who watch track and road running. We watch and follow our runners for a sense of wide-eyed wonder and inspiration. What the elites do affects us and makes us want to be our best selves. They are one of the reasons we join high school teams or go out for a ten-miler after a long, hard day at work. And we mostly identify with successes by people like ourselves: Americans, or people from the countries of our ancestors, or our local high schoolers or collegians or struggling semipros. This is the purpose that track and field serves as a spectator sport. It is at times just as crass and commercial as other pro sports; Nike supports pro runners mostly because it will sell more shoes (and shirts and bags and whatnot). But when Meb Keflezighi does something amazing (as he has done time and time again), it makes me want to train enough that I will go through four pairs of shoes in a year instead of one. The same is true when someone from my alma mater becomes an All-American or when the guy who works at my local running store qualifies to the Olympic Trials. 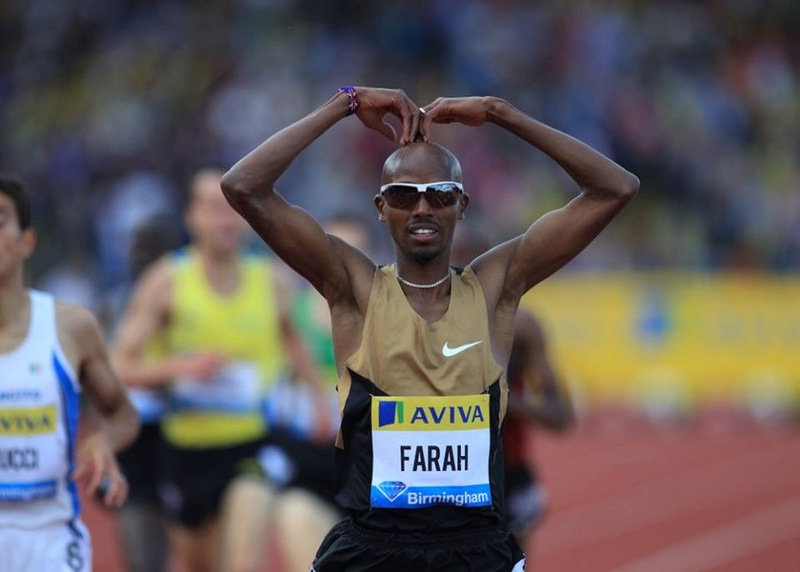 Track and field and road racing at their highest levels are not just mere entertainment; they inspire us to organize and measure the best of our energies and skills. Good article. My question, though, isn’t so much why there are so many <3's now as what the hell happened in the 80's and '90's? I wonder if the performance trend looks the same or different in other mass-participation endurance sports (swimming? cycling?) over that time period. Or did everyone switch to golf (or nothing) for a few years? Response to BCC: In the ’80s many U.S. runners appear to have been tempted by training that promised quick results and failed to deliver. Also, they became isolated, fearing that other runners might pick up their training secrets and beat them for prize money. It all worked counter to the time-tested path to success.